The wicked vampire hunter secretly flew above the old castle and emptied a whole sack of stinky garlic over the ruins! It is Leo Longtooth’s job to watch over the sleeping vampire children in the castle’s basement, and he must protect them from the horrible stench in the air. Can you help Leo clear the smelly garlic out of the ruins? With the help of the little glowing bat, you can magically clear the garlic out of the castle without touching it! Be careful, though -- if the garlic falls through the cracks in the floor, it will spread its nasty smell into the basement where the vampire children sleep. 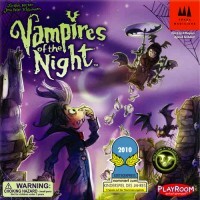 Have fun playing Vampires of the Night in the light, in the twilight, or even in the dark with this unique glow-in-the-dark 3-dimensional board! Add a Review for "Vampires of the Night"